If you want to stray away from the cookie-cutter wedding, holding your nuptials in an unusual location is a great way to create an unforgettable event. Whether you are looking for an elegant soiree or a fun, off-beat evening, there is a venue to fit every couple’s taste. Colleges & Universities – Especially for college sweethearts, exchanging vows at an alma mater can be both memorable and collegiate. 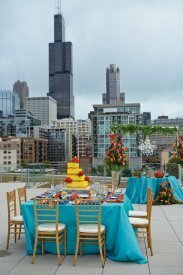 Rooftops – A beautiful rooftop terrace can be a gorgeous setting for an at-dusk ceremony. The fresh air and beautiful views set the stage for a romantic night. Places of Business – Have you ever heard of those infamous Walmart weddings? An employee getting married in their workplace is more common than you may think. It can also be a fun way to celebrate with your coworkers. Museums & Historical Buildings – Many historical buildings and museums have beautiful architecture and design making them a perfect choice for elegant affairs. Plus guests receive free admission all night long! Sports Venues – Have a favorite sports team or just a love of the game? Many sports arenas, racetracks, and even bowling alleys open their space to couples looking for fun on their special day. Library – Weddings at the library don’t have to be quiet. Many locations will rent their space during off-hours so you can celebrate in style while surrounded by literature. When planning a wedding at a unique venue, it is important to consider all the details involved. Some locations, such as museums, require you to purchase additional liability insurance for the event or even cover the cost of uniformed security personal. Other sites may not allow alcohol to be consumed on the premises. Partnering with a professional to help plan this type of event can help ensure both the location and the day are perfect. At Windermere Elegant Weddings, we have worked with countless couples to plan their special day in some pretty unusual spots. From Union Station to an auto dealership, we have experience coordinating large events at unique venues. Contact us to learn more about our event planning services.